It was little wonder the Zind Humbrecht Gewurztraminer Clos Windsbuhl blew away the Portugese Dao as, at six times the price and from one of the most prominent producers in Alsace, had the little Dao come anywhere close I’d be jumping up and down and alerting you to a QPR doozy. Sadly not. Today’s blog entry is simply a sum up of the wines I haven’t yet posted, a Super Sunday round up if you will. To stay in the Italian vein perhaps the best value of all was from Lagrein. Another dreaded Lagrein. Those familiar with this blog will know I am forever trying to find a place in my heart for Lagrein and end up panning it. Not this time, £10 from Virgin wines and Bobs your uncle. Not our Bob. Just the proverbial Bob. However it was the Gewurztraminer that stole the show and is my wine of the week. 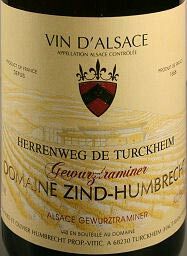 This is a wine for a special occasion by one of the very best producers in Alsace, some might argue the best Gewurztraminer in the region too and would go great with a variety of styles of food. As Alsatian Gewurztraminer is high in acidity compared to other Gewurztraminers from other areas you would do well to pair this with moderately spicy Indian, Chinese or Thai food. Any of these will go much better than the sunflower seeds I nibbled on during my tasting. Where can I find this Wine? Tried any of these wines? What was your wine of the week? What a mixed bag.Envious of the 05 ZH, hard to lay my hands on any decent Alsace.